Unfortunately, foot pain is a problem many of us face every day. It is often caused by ‘plantar fasciitis’, which is just a fancy term to describe inflammation of tissue that connects your toes to your heel. So now that you know what plantar fasciitis is, you are probably wondering how to stop it. Well, there are shoes designed to help alleviate pain caused by the disorder. This is your guide to finding the best slippers for plantar fasciitis. You see, it is important to have proper arch support, both indoors and out, if you suffer from plantar fasciitis. The internet is an ideal place to shop for such shoes, as you can easily search for ones that are specifically designed to help you find pain relief. Believe me, I know wearing shoes inside is not always desirable, as that’s usually when we like to let our feet breathe. 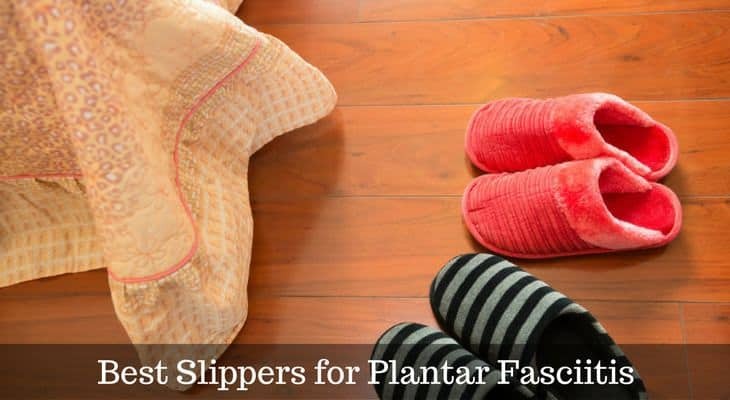 However, there are plantar fasciitis slippers out there that are comfortable enough to help you change your mind. 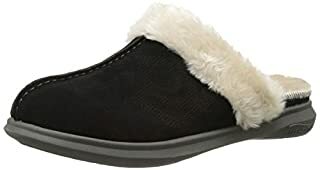 One of the top rated products on the market is the Vionic Women’s Relax Slipper. It is one of the best slippers for women experiencing plantar fasciitis. It is designed with a TPR outsole, which makes it ideal for indoor use. Its plush orthotic footbed provides the support needed to consider these one of the top arch support slippers. It also has an easily adjustable velcro strap, which makes it easy to slide on and off. Furthermore, its flexible EVA midsole absorbs shock, and reduces stress on feet, ankles, and knees. Best of all, it is also made from polyester terrycloth fabric, which provides for maximum comfort and softness. Overall, I think it’s easy to see why these are considered one of the top plantar fasciitis slippers. Wearing shoes inside is not a priority for most, but I think in this case we can make an exception. Run big. Best to order a half-size down. This is another orthopedic slipper which is designed to be one of the best slippers for women with plantar fasciitis. It features a contoured orthotic insole, which is designed with great anatomical arch, making these one of the best slippers with arch support. It features a leather upper and a lightweight sole, which makes it practical for both indoor and outdoor use. Additionally, its sole is made with air cushioning pads, which creates a soft and easy step, while reducing stress placed on your feet, ankles, knees, hips, and even your lower back. It also has a velcro strap, which makes it easily adjustable and able to fit as comfortably as possible. Its soft, seam free lining is padded with foam and offers the ultimate comfort and relief for people suffering from plantar fasciitis. If you are looking for a slipper that offers style, comfort, and warmth, while also offering practicality, then look no further than right here. Sizing can be too narrow for some. Hang on to your seat, because I am about to show you yet another supreme plantar fasciitis slipper. It is designed for both men and women, but better yet, comes with multiple color options for women. Sorry guys! However, with the comfort and relief they provide, I can imagine most will not care much about what color they are. 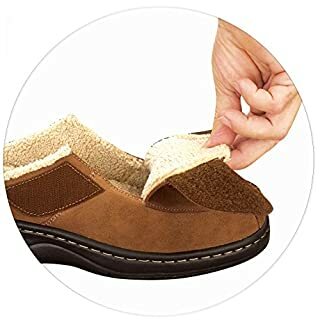 This orthotic slipper is made with leather and features a synthetic sole, which makes it extremely durable, and thus ideal for both indoor and outdoor use. Its contoured total support footbed is lined with faux fur, which provides for superior comfort and makes it an ideal winter shoe. What’s more, I hear that they also are pretty true to size. Simply stated, I believe it is safe to say that the Spenco Supreme definitely earns its name as one of the best slippers out there for men and women with plantar fasciitis. Treat yourself to the Asheville Mens Comfort Orthotic slipper. Its contoured orthotic insole and superior anatomical arch support make it one of the best slippers for men with plantar fasciitis, as these features help alleviate stress on the foot, knees, hips, and lower back. Furthermore, its lightweight sole is made with an Ergonomic-Stride(TM) design, which eases your step. Your step is softened even further with padded air cushions. Plus, its wide design eliminates pressure on bunions and provides plenty of room for toe movement. As if that’s not enough, its soft, seamfree lining is padded with foam and eliminates pressure points. It also features a leather upper. It also has adjustable velcro straps on the sides, which helps them fit perfectly. Better yet, the insoles are removable and easily washable. Reality is, if you are a man who suffers from plantar fasciitis, then I would definitely consider these the slippers for you. 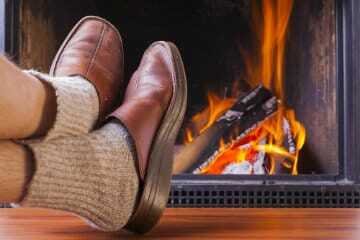 They are warm, comfortable, durable, and provide much needed relief from foot pain. What’s not to love? Can make your feet hot. Sometimes slide off easily when walking. 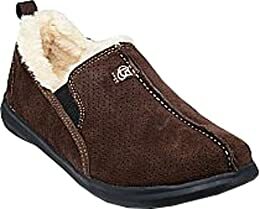 Another fantastic slipper for men with plantar fasciitis is the Vionic Glenn Mens Corduroy Slipper. Its synthetic, rubber insole makes them perfect for wearing around the house. Its removable orthotic insole was designed by a podiatrist, and allows for better posture and stability. Additionally, its arched footbed provides the arch support needed to provide relief from pain caused by plantar fasciitis. Its thermoplastic rubber outsole is extremely durable and provides great traction for grip. Plus, its EVA midsole provides for optimal cushioning, and decreases the stress placed on your feet while walking. As if that’s not enough, this clog slipper is made with soft corduroy, and easily slides on and off. 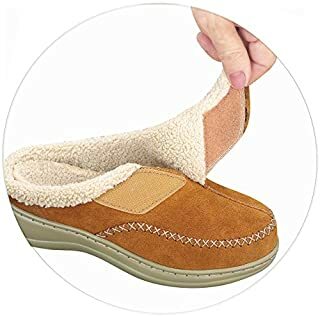 All in all, with its unique corduroy design and durability, I would say these are some of the best slippers for men suffering from plantar fasciitis. In short, if you suffer from plantar fasciitis, it is absolutely necessary to make sure you aren’t walking around barefoot, especially on hardwood floors. The point is, if you wear orthotic slippers while indoors, you can greatly reduce the pain caused by plantar fasciitis. 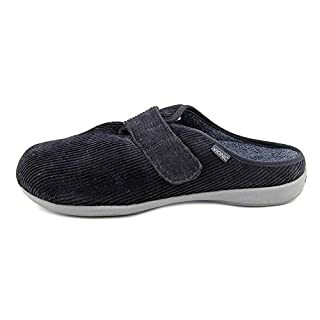 Bottom line is, if you want relief from pain while experiencing maximum comfort, then I believe it would be a great idea to invest in a pair of the above slippers designed for plantar fasciitis. What’s more important than your happiness and health?